I suggested a sticky for camera bags, so I'm starting it. Once it's stuck I'll add some content and I hope others will too. Maybe we should establish a general format like in the tripod sticky. I just received a Tenba Shootout Waistepack along with a few other new LBA/GBA items. This bag is very well made of high-quality materials. While I want a bag to carry a substantial amount of gear I also want the thing to be as compact, comfortable and convenient as possible. I was, and still am, interested and attracted to the new Tenba Messenger bag. It looks like a really nice bag, well designed and big enough, but not too big. But then I stumbled on the Tenba Shootout Waistpack for much less money than either of the above. I prefer the quick access top of the others, but for $40 less I took a closer look at the waistepack. It's an inch smaller in H and D, but it has a bigger width than the medium Shootout shoulder bag and is $35 cheaper as well. The clincher for me was that when used as a shoulder/sling bag the top of the Shootout Waistpack opens away from the user and allows easy access. From the claimed dimensions I judged it should fit my immediate needs. minimal cleaning supplies, 3 filters, 2 step up rings, extra SD cards, phone, notepad & dig recorder. After a couple of weeks of looking and thinking I ordered the DA*50-135 and this bag from B&H. As far as the claimed dimensions go, I think it's safe to say practically all marketing overstates the actual usable, interior capacity of camera bags. This bag in particular may actually achieve it's stated dimensions with all the padding removed and stretched to it's maximum, but as delivered it's much smaller. When I unpacked it my 1st thought was that no way would it hold this kit. Luckily for me I have been pleasantly surprised. My 1st priority is to have the camera in a ready position and for it to be easily accessible. To me that means nose down or laying on edge back to front, so the first thing I checked was whether the K20 w/grip and 16-50 would fit pointed down and it wouldn't. I removed all the dividers and saw that the removable bottom padding is almost an inch thick. With that removed the bag has less structure and protection. but the cam w/grip and lens fit nose down. The 50-135 would still not fit upright, so I re-arranged and laid it down. With further squeezing and adjusting I am able to get the rest of the kit packed in and the cam is in the ideal position for me. The bag is definitely maxed and the top is a little difficult to zip (but more than happy to unzip), it still functions very well and when the cam is removed everything else is easily accessed. Surprisingly, the seemingly gimicky "quick access doors" on the ends are very functional and allow access to my lenses even when the cam is inside and the bag is closed. To me this means when I get a 2nd body (K7 w/prime lens over my shoulder) I can easily access the other lenses. The additional pockets hold the rest of this kit easily. I put a microfiber cloth and small cotton towel and lens pen in the lid's mesh pocket; 77mm and 52mm filters and step-up rings in one end pocket, phone, notepad and dig recorder in the other end pocket and SD cards in the front pocket with room to spare. I also removed the waist belt and the top handle. I may not need a waist belt at all as this bag settles well against my bod both in carrying position (above the hip) and working position (below the hip). In the 2nd photo the camera cradle is shown w/o the cam (had to use it for the pics). In the 3rd photo the 50-135 is on the left and an A35/2 and AF280T are on the right. Also my A50/1.4 fits on top of the 35, but makes for a very tight fit. Also, the stock lens hoods for the 2 DA* lenses won't fit. I basically always use a lens hood and for quick action prefer a basic rubber hood anyway, so this is not an issue for me. In general, I'm happy to say this bag does just what I need it to do very well. It's just about as small as possible, and fairly discreet, and still functional. The price was right, @US$75, and it's very well designed and constructed. Last edited by StevenVH; 12-14-2009 at 08:24 AM. I chose the 7500 wich is nr three of six in sizes. The next one (8500) was to large for my wanting. Folow the link above o watch all six sizes. As you can see, the bag is not soft. It has a hard feeling and stands upright on its own. It feels safe, like i could bump into things on the street without worrying about it. It has a nice handle on top, a good wide strap with a soft shoulder pad. On the backside there is a pocket with a rain cover. You can get to the camera very easy with the bag on your body! The outer lid fully open. You can see here that the lid is kinda hard. In here there is various pockets for various thingys!. The camera compartment is still closed with zippers. So theres a lot of room for small primes and such wich can be great for the Limited guys. I think i could get a quite long tele down there to, mounted on the camera, wich is also great. And i am sure the DA*50-135mm will fit mounted on camera! On minus is that the camera wont fit with a grip mounted.....i think...havent got one, but its seems that way. So if thats important, think one step further to the next size! Last edited by the swede; 12-18-2009 at 01:20 PM. Wow the swede, that is a very high quality looking bag, I love the interior. very nice bag, is that waterproof? The texture is water repelant i believe, so it will manage som light rain. But there is a raincover included so i dont thinks its waterproof. And the zipps would leak in water if the bag was soaked. My biggest gripe with many bags is when you cannot access lenses without compromising the entire package. That is to say, either taking the bag off or exposing everything that's in it. I've been through quite a few bags over the years and this has always been one of the biggest complaints with them. Thanks for the Gigolo review. It looks like a really nice and functional bag, even more so than the Crumpler Million Dollar Home series. I'd totally order one, but it doesn't look like it's available in the States. 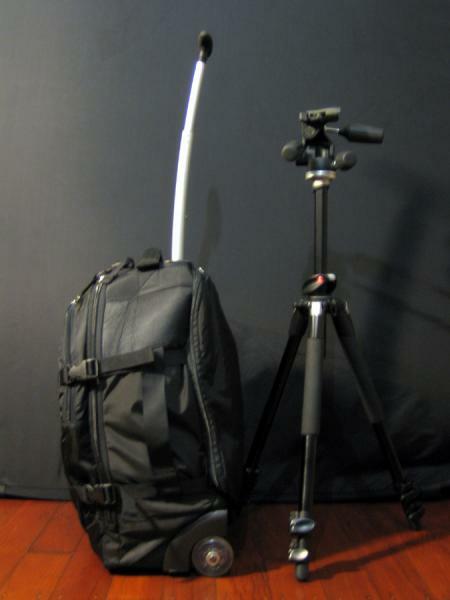 Not my review, but a good one on the Kata DR-467 laptop/camera bag. Finally I have a Billigham, thanks to my wonderful wife who bought it for my birthday! I have long admired their design and craftsmanship and with the new 7 series I have found the larger 307 is the ideal bag for my main usage. It actually "feels" smaller and less cumbersome than my National Geographic Explorer Medium and Large bags which I've been using for the last year or so (I don't like black nylon photo bags) and actually easier to use and access than my "old faithful" Rezo 190" ugly black bag" which was beginning to get very cramped! In fact the 307 doesn't feel as "chunky" even though it holds vastly more kit. There are two large front pockets and a zippered rear pocket plus 6 small internal pockets around the inside edges. Opened (it has a huge "maw"! ) complete with K20D+17-70, 12-24mm, 50mm macro (under the 12-24), 60-250mm, Metz flash, Cokin ND & several grads, holder + rings, CPL filter, blower, cloths, releases, cards, lots of junk and even room left over for my BG2 grip if needed! I've just added a 100mm f2.8 macro (where the blower was, it's been re-sited with the grads) and there is still room left! It's very comfortable over the shoulder, or transversely across the body, with it's wide strap and heavily cushioned pad. 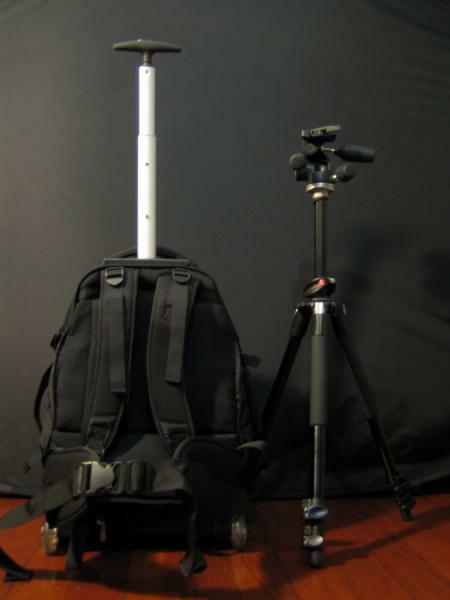 You can also fit tripod straps to hold a tripod under the bag and there is a backpack style "clip on" shoulder harness available if required. Needless to say, I'm really pleased with the bag. Here are some more shots comparing it size wise with my National Geographic Explorer medium and large bags and also my old faithful Lowepro Rezo 190 which you may find useful. Last edited by Richard Day; 12-22-2009 at 01:34 PM. Reason: Added pictures and corrected syntax. After a quest to find the prefect setup for me, I did a DIY job instead. Manf 190PROB next to it to gauge the size. It's a backpack within a roller backpack. 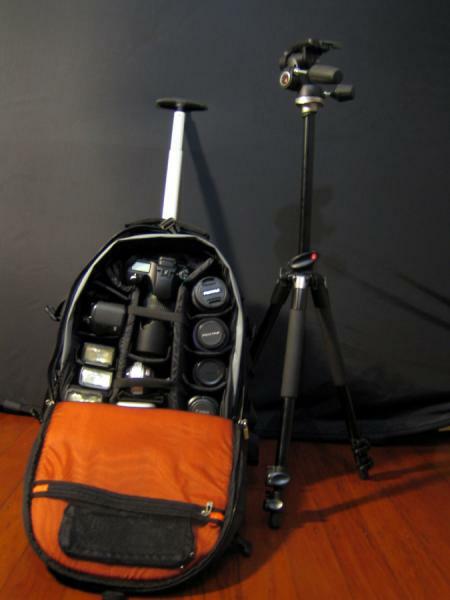 Holds a ton of stuff, including laptop and even a large twistfold reflector. Apologies for the poor IQ, shot it with a camera phone. Last edited by Mohawk; 12-26-2009 at 07:09 AM. ^ Looks good but the dark interior wouldn't work for me. One reason I got the Kata, yellow inside, hold 17" lappy, love it! Works for 50yr old eyes! LOL! When I was shopping for a bag recently I saw a few offerings with some kind of quick access panel or pocket. I thought it was kinda' gimicky as stated above, but found it's actually functional on the bag I have. The quick access is done with the red zipper pulls shown in the photos. I can even pull the 50-135 out and smaller primes are easily accessed. Another brand to add to the list for consideration. The Delsey Pro (on the left in photos). The Delsey GoPix 90 (on right) and comments for this bag are in red. The Delsey Pro has accompanied me on numerous overseas trips since 2005. It has been in heavy rain, where the raincoat proved its worth, it has been in urban and rural situations, dropped, thrown, kicked, 'checked in' an aircraft hold, and dust and dirt. The GoPix 90 I purchased in August 2009 to try and beat the carry on weight limit on our trip to the US. It too has proved to be a tough little bag that is very capable. The Delsey Pro has stood up to everything I have been able to throw at it and is a strong, versatile bag. Zips, buckles and straps show no signs of wear and have never failed in operation. The outer fabric is easily washable, and while showing some ceiling dust here from pulling it out of the warddrobe, a wipe with a damp cloth will bring it up like new. It is not a bag you would "throw around" as much as the Pro as the weight saving has to come from somewhere. It holds a laptop and associated bits and the front bits & pieces is a good size and holds cards, batteries, cable releases, torch etc. The backpack part of it is very comfortable, once adjusted and settled in it is no effort to carry it around for an extended time. Tripod/monopod mount is simple and effective. The rain coat is store underneath at the back and comes out quickly and easily...and is very effective. The downside: the only "fault" I can find is its nett weight. The bag weighs in at almost 4kg empty (my scales), so if travelling by air with a 7kg carry on limit, you have to decide carefully what to pack. Travelling by road it is in a class of its own where the weight doesnt matter. For a budget bag (costs about 1/3rd of the Pro) it is hard to fault the GoPix 90, perhaps a bit more thought in to the front pocket configuration/access would help. My only other gripe was that it would not stand up by itself, wanting to fall forward. The Pro will stand on its own feet.